We’ve been working on a redesign of MyOnlineWeddingHelp.com to help you find better prices on things you need to put on a “budget friendly” wedding. 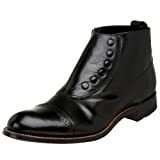 As part of that we have devoted a separate section to < target=”blank” href=”http://mens-shoes.myonlineweddinghelp.com/”>men’s formal and dress shoes here: http://mens-shoes.myonlineweddinghelp.com/. If you (or the man in your life) are on a strict budget and must dress in formalwear, the used tuxedo shoes page and the cheap formal wear shoes (around $50 or less) pages may be of special interest. Check the Shoes Discounts and Promotions page, here for current offers from our shoe seller partners.